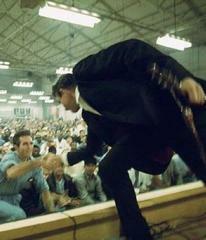 The Folsom Blues Breakout events are truly all about Johnny! To help us celebrate and commemorate this American music icon, the FBB staff has compiled an extensive timeline of Johnny’s biography, accomplishments, awards, and life-spanning milestones. Enjoy reading, viewing, and, most of all, listening to his music. If you notice any information needing correction or events to add, email us with them. Enjoy! 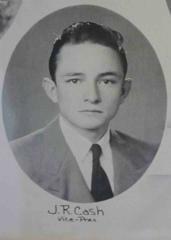 Johnny was born and named J.R. Cash (no first or middle name) to parents Ray and Carrie Cash in Kingsland, Arkansas. He is the fourth of five children. His brothers were Roy, Jack, and Tommy, and his sisters were Reba and Joann. As a child, gospel songs taught to him by his mother is a major influence on him. The family later moved to Dyess, Arkansas. His Dyess home is shown on the left. 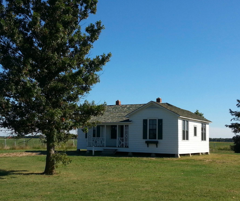 There, the Cash clan lived in this five-room house and farmed 20 acres of cotton and other seasonal crops. He lived a simple life involving school, church, work in the cotton fields, and music - his own, his family's and what he heard on the family radio. His mother Carrie bought him his first guitar for his 10th birthday. Songs surrounded the young J. R., be it his mother's folk and hymn ballads (she was a devout member of the Pentecostal Church of God), or the working music people sang out in the fields. 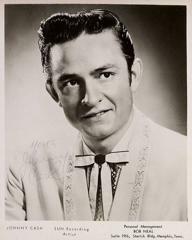 From an early age Cash, who began writing songs at age 12, showed a love for the music that enveloped his life. Sensing her boy's gift for song, Carrie Rivers Cash scraped together enough money so that he could take singing lessons. After just three lessons, his teacher was enthralled with Cash's already unique singing style. She told him to stop taking lessons and to never deviate from his natural voice. J.R. Cash graduates from Dyess High School. He traveled to Pontiac, Michigan seeking employment and worked briefly in an auto body paint shop. 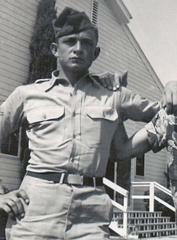 Seeking a better option, he enlisted in the Air Force where he became John R. Cash since the Air Force did not accept initials as a name. He was sent to Lackland Air Force Base in San Antonio, Texas for training, where he met Vivian Liberto, his future first wife. After training, Johnny was stationed in Landsberg, West Germany, where he worked as a radio intercept officer, eavesdropping on Soviet radio traffic. He was the first radio operator to pick up the news of the death of Joseph Stalin. While in Landsberg he created his first band, named "The Landsberg Barbarians". During his military service, he acquired a distinctive scar on his face as a result of surgery to remove a cyst. He and Vivian corresponded regularly amassing thousands of love letters. He was honorably discharged as a staff sergeant, and returned to Texas. 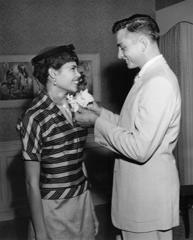 More than four years after he met her, John married Vivian Liberto. They had four daughters: Rosanne, Kathy, Cindy, and Tara. John and Vivian moved to Memphis where his brother Roy (who worked at the local Chevrolet dealer) arranged a job for him selling appliances door-to-door. Roy also introduced John to two of the mechanics at the Chevy dealer’s garage: Luther Monroe Perkins and Marshall Grant, both guitar-pickers. Together with steel guitarist A.W. 'Red' Kernodle, they formed the Tennessee Three. 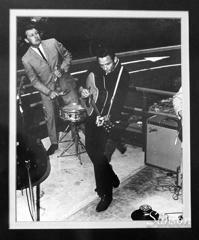 By the end of the year, Kernodle left the band, and John renamed the group John Cash and the Tennessee Two. They played gospel tunes at an audition for Sam Phillips of Sun Records, but Sun Records was no longer recording gospel, and Sam told Johnny to come back with Country Western. John and the Tennessee Two sign a record deal from Sam Phillips and Sun Records. 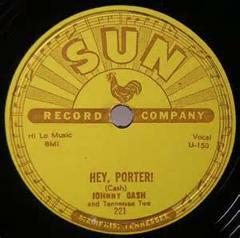 Sam Phillips renamed John Cash as Johnny Cash, and the record "Hey Porter," and "Cry, Cry, Cry," (Johnny's first single) is released. 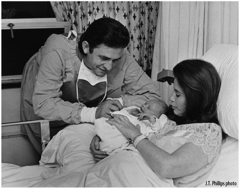 Vivian gave birth to Johnny's first daughter, Rosanne. 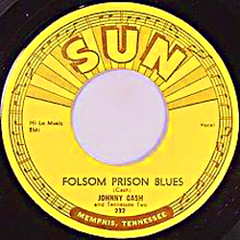 Sun Records released "Folsom Prison Blues," which coincides with their debut on the radio program “Louisiana Hayride”. 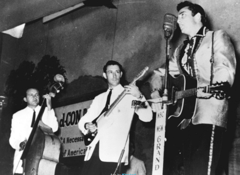 A big dream of Johnny’s came true when he played for the first time at the Grand Ole Opry. He landed a regular spot and traveled to Nashville each Saturday night for to perform. Johnny meets June Carter for the first time backstage at the Grand Ole Opry, when Carter was singing background vocals for Elvis Presley. Johnny's second daughter, Kathleen, was born. 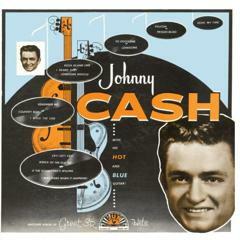 Johnny's first album (Johnny Cash with his Hot & Blue Guitar) is released. Johnny announced that he was leaving Sun Records, signing on with Columbia Records, and relocating to Los Angeles. This was primarily due to Sun Records refusing his requests to record a gospel album and to raise his royalty fees. 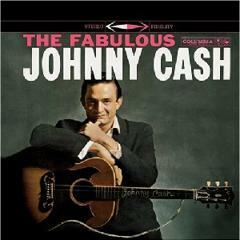 “The Fabulous Johnny Cash”, Johnny’s first Columbia LP enters Top LPs chart, and climbs to #19. Johnny's third daughter, Cindy, is born. Tennessee Two becomes the Tennessee Three with the addition of drummer W.S. “Fluke” Holland. Holland had been the drummer for Carl Perkins and Elvis Presley, also on the Sun Records label. The Carter Family joins the Johnny Cash road show. Johnny's fourth daughter, Tara, is born. 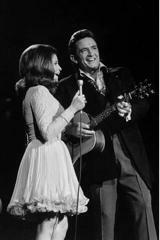 Johnny and June’s duet "Ring Of Fire" (written by June Carter and Merle Kilgore) was recorded in Nashville with mariachi-style trumpets and the Carter Family backing the vocals. 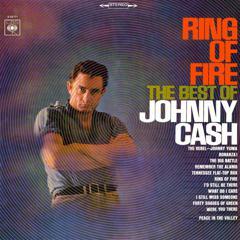 Columbia released the album “Ring of Fire: Best of Johnny Cash”, containing singles released between 1959 and 1963 and featuring hit single Ring of Fire. 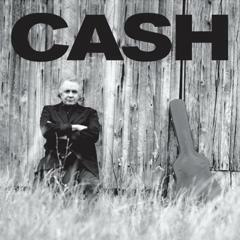 “Ring of Fire: Best of Johnny Cash” album is listed #1 on Billboard’s inaugural Hot Country Albums chart. It remained No. 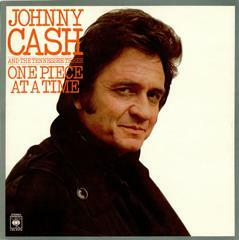 1 for a total of 14 weeks and later became Johnny’s first RIAA gold album. A 508-acre forest fire in the U.S. Forest Service Ojai District (CA) was caused by a faulty exhaust system in Johnny’s truck. 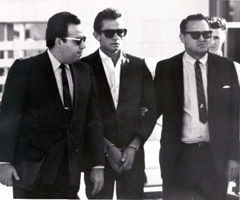 Johnny, reportedly under the influence of alcohol or drugs or both, had driven the truck to access a fishing stream. He was successfully prosecuted and fined $125,000. 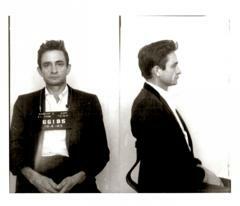 Johnny Cash was arrested returning from Mexico with possession of 668 Dexedrine and 475 Equanil pills found in his guitar case. He receives a 30-day suspended jail term and $1,000 fine. Shortly after this incident that Johnny appeared at the Grand Ole Opry stoned, and, angry about a faulty microphone stand, takes the stand and drags it across the stage footlights. The Grand Ole Opry fires him. Due to Johnny’s escalating drug use, Vivian filed for divorce, and the divorce was granted in late 1967. 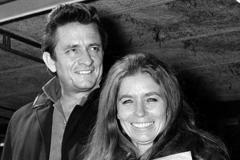 Johnny moved back to Nashville, where June Carter began to lead him back to Christianity. Johnny had his 13,880 square foot home built on Old Hickory Lake just outside of Hendersonville, TN, about a 20-minute drive from Nashville. Still hooked on drugs and alcohol, and miserable over his divorce, Cash waited to die in or near Tennessee's Nickajack Cave, southeast of Nashville on the Tennessee River. Instead, he found God and began his substance abuse recovery. 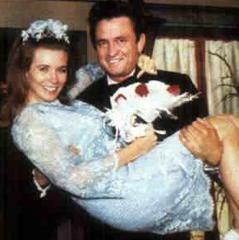 Johnny and June were married at a church in Franklin, Kentucky. Merle Kilgore was best man, and there was a nonalcoholic reception at Johnny’s new home in Hendersonville, TN, where they lived for the next 35 years. 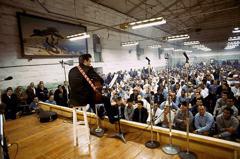 At the 11th Annual Grammy Awards, "Folsom Prison Blues" wins Best Country Male Vocal Performance and the “Johnny Cash at Folsom Prison” album wins Best Liner Notes (the written accounts on the “liner” that protects the record inside the album cover). 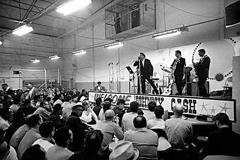 "The Johnny Cash Show" premiered on ABC-TV from with special guest Bob Dylan on the first show. The regular cast included Johnny Cash, June Carter and the Carter Family, the Statler Brothers, and Carl Perkins. Bob Wootton became a permanent replacement and mainstay in Cash's band for the next three decades. The Screen Gems 58-episode series ran from June 7, 1969 to March 31, 1971 on ABC; it was taped at the Ryman Auditorium in Nashville, Tennessee. The show reached No. 17 in the Nielsen ratings in 1970. Johnny Cash's greatest year: he sold over six-and-a-half million records, which was more than any other artist at that time had sold in one year. 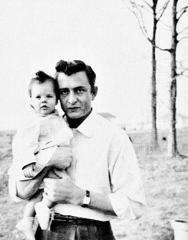 Johnny’s only son and child with June, John Carter Cash was born. 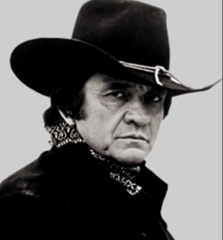 "The Johnny Cash Show" which premiered on ABC-TV on June 7, 1969, ended. The show reached No. 17 in the Nielsen ratings in 1970. “Man In Black” album was released. In includes anti-war activist "Singin' In Vietnam Talkin' Blues" and "Ned Kelly", and a duet with evangelist Billy Graham. It made the Country &Western chart and was the #1 hit for 2 weeks. The Johnny Cash Collection (Greatest Hits, Volume II) entered Country & Western chart, climbed to #5, and became his final RIAA certified platinum album. 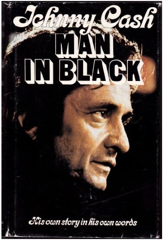 Johnny’s autobiography, The Man In Black, is published. Johnny receives the Award of Merit at the 4th annual American Music Awards. Johnny is inducted into the Country Music Hall of Fame. At age 48, he is the youngest living inductee. Man In White, a novel about the life of Paul the Apostle by Johnny Cash, is published. 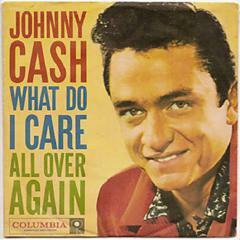 Columbia drops Johnny Cash from the label. 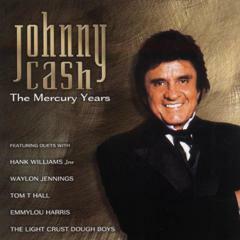 Mercury Records signs on Johnny. “Mercury Years” is an 18-track round-up of the best tracks recorded during his stay with Mercury during the late 80's and early 90's. Includes duets with Emmylou Harris, Hank Williams Jr., Waylon Jennings, W. Lee O'Daniel and Tom T. Hall. Highlights include a cover of Dylan's “Wanted Man”, “Sixteen Tons”, “Sweeter Than Flowers” and the former #1, “Don't Take Your Guns to Town”. Johnny is inducted into the Rock-and-Roll Hall of Fame. He became the only person ever inducted into the three Hall of Fames (Rock-and-Roll, Country, and Songwriters Halls of Fame. At the 34th Annual Grammy Awards Johnny receives the Grammy Legend Award "for ongoing contributions and influence in the recording field.". 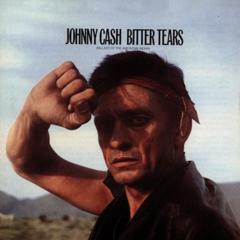 Johnny’s second album with American Recordings, “Unchained”, is recorded. 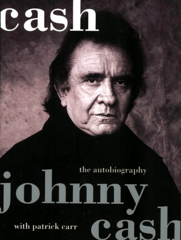 The second story of Johnny’s life is published: Cash: An Autobiography. Johnny receives the Grammy Lifetime Achievement Award, which says "Johnny Cash, truly one of the most influential figures in country music, transcends both generations and musical genres." Johnny spent his 70th birthday in Jamaica, relaxing away from the Nashville winter and enjoying a quiet celebration with family. Sony Music and Columbia produced “Johnny’s 70th Birthday: Man In Black (Limited Edition 70th Birthday Sampler)”. It included his classic hits along with “Girl From The North Country” (Johnny Cash & Bob Dylan), Wanted Man (Johnny Cash), and Me and Bobby McGee (Johnny Cash, written by Kris Kristofferson https://www.youtube.com/watch?v=XnhAX8BARBs). 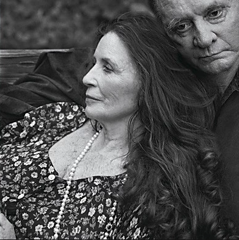 Johnny's beloved soulmate and wife, ,June Carter passes away at 73 years old from of complications following heart-valve replacement surgery, in the company of her family and her husband of 35 years. 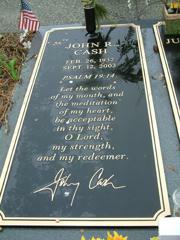 Only four months later, Johnny Cash passes away from complications related to diabetes. 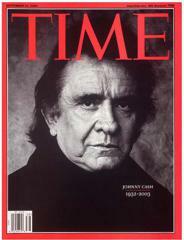 Johnny Cash portrait graced the cover of Time Magazine and an extensive article about Johnny's life was the cover story. 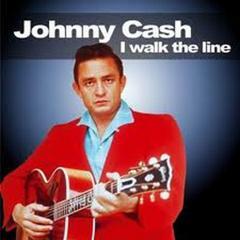 Johnny’s biographical movie “Walk The Line” (20th Century-Fox) opened nationwide and stars Joaquin Phoenix as Johnny Cash and Reese Witherspoon as June. It was co-written and directed by James Mangold. 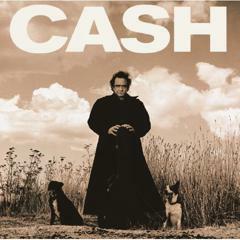 The album, Legend of Johnny Cash was certified Gold on 12/7 and Platinum on 12/14 by the RIAA. 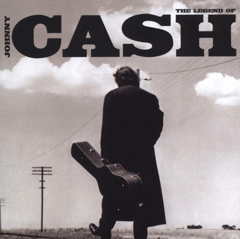 Legend of Johnny Cash was certified 2x Platinum by the RIAA. 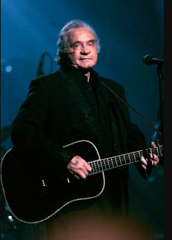 The albums "The Legend of Johnny Cash" placed 9th and "American V: A Hundred Highways" placed 182nd on the Billboard 200 chart. The Vivian Liberto Cash memoir I Walked the Line is published. 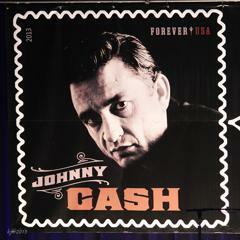 Release of the Johnny Cash Forever stamp coincided with the grand opening of the new Johnny Cash Museum, a short walk away from the famed Ryman Auditorium. The first-day-of-issue-ceremony was held at the start of the CMA Music Festival. 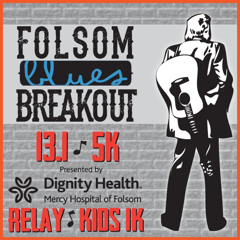 The Johnny Cash-themed First Annual Folsom Blues Breakout Half Marathon was held in Folsom, CA. 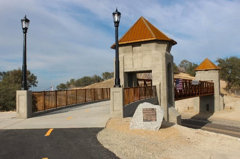 It starts in the shadow of Folsom Prison on the Folsom Crossing Bridge and follows a scenic route around Lake Natoma to finish in Historic Folsom. A Johnny Cash Finish Festival with a JC tribute band awaited the runners and their friends at the finish. The hugely popular event has been held in October every year since. First Annual Johnny Cash Heritage Festival. A concert that closed out the Festival took place in an Arkansas field where the music legend picked cotton as a youth, near his restored boyhood home in Dyess, Arkansas. The small town is about 50 miles north of Memphis, Tennessee. The concert featured Cash's oldest daughter, Rosanne Cash, and Kris Kristofferson. The Johnny Cash Hendersonville lakefront property is put on the market, appraised for $1.1 million. The original home and property were purchased in 2005 for $2.2 million by Barry Gibbs of the Bee Gees and his wife Linda. It was burned nearly to the ground in 2007. The Gibbs sold it in 2014 to James Gresham of Lakehouse Homes, the current owner/seller.